The ASUS ZenBook Flip S UX370 is a new 2-in-1 convertible notebook that was just announced during a press conference in Taipei. Its highlights are a super slim design, a high resolution 4K display and an optional stylus. How good is the new ZenBook Flip S UX370? I had the chance to play with it shortly after the announcement. ASUS has done a very good job when it comes to the design of the ZenBook Flip S. It’s completely made out of aluminum and feels very high end in your hands. 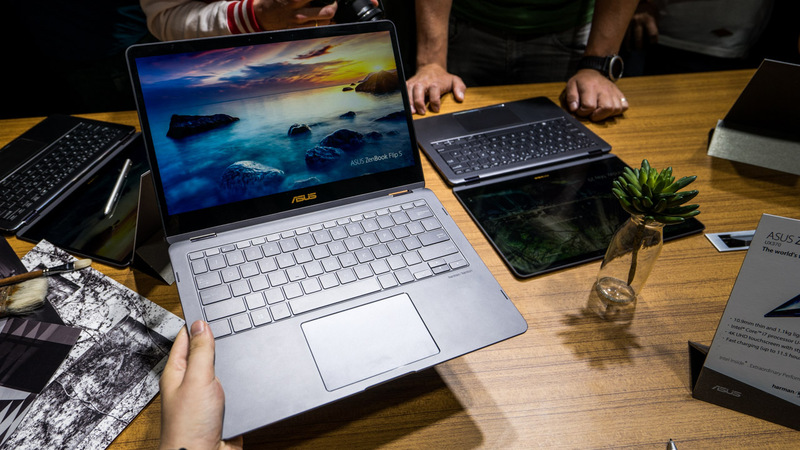 With 10.9mm it’s the thinnest convertible in the world – well, according to ASUS but it seem to be true. At the same time it’s quite light for a 13.3 inch convertible with 1.1kg. Like with all of the Flip lineup you can rotate the display to turn it into a tablet. Thanks to its slim design it actually feels like a tablet as well. Part of the reason is the weight, but also because of the 6.11mm slim bezel on the side of the display. Above the touchscreen sits a front camera which you can use for video chats. There’s the logo from ASUS under the display and that’s pretty much it. There’s no camera on the back. Quite useful is the fingerprint sensor on the side though which lets you unlock Windows 10 thanks to Windows Hello very quickly. There are also two USB Typ C ports on the side as well as an audio port, the power button and the volume controls. Like with most laptops there will be several versions of the ZenBook Flip S. The top of the line model comes with a 13.3 inch 4k display with a resolution of 3840 x 2160 pixel. You can get it with a 1920 x 1080 full hd panel as well though. You can use the touchscreen not only with your fingers but also with an optional stylus, the ASUS Pen. It’s made out of metal and seems to be quite well build. Unlike the Surface Pen from Microsoft it supports 1024 pressure points only though so it won’t be as precise. It should be fine for most though. Inside the ZenBook Flip S UX370 runs an Core i5 or Core i7 processor from Intels latest Kaby Lake generation. It’s the more powerful U series which requires active cooling. You’ll be able to get it with up to 16GB of memory and with a 256GB, 512GB or 1TB SSD. According to ASUS the battery life will be at up to 11.5 hours which seems quite good for a slim convertible like this. It supports fast charging too – apparently you can charge it up to 60 percent in just under 50 minutes. I quite like the ASUS ZenBook Flip S UX370. My first impressions are very good because the build quality is excellent, it’s very slim and lightweight but does not lack any features. It’s a premium device with a fingerprint reader, optional stylus and the latest hardware. You have to pay for that though – the cheapest version will cost 1099 dollars. No word on availability yet.